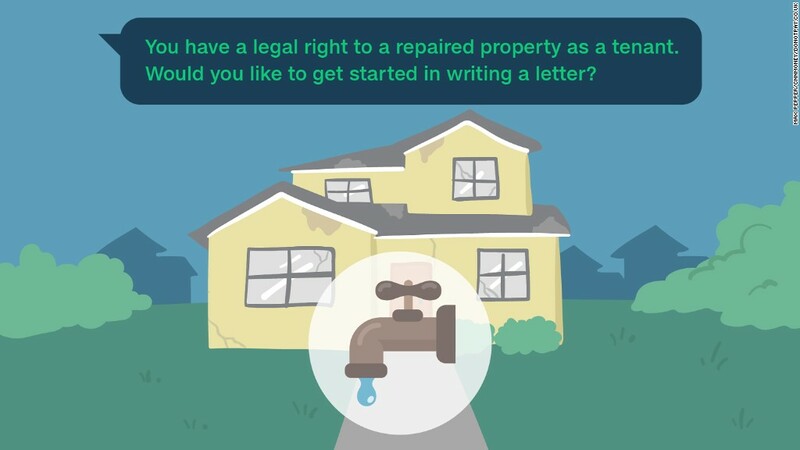 Stanford student Joshua Browder just launched a new "chatbot" service on his website DoNotPay.co.uk that's designed to help tenants force their negligent landlords to fix problems like leaky taps or moldy walls. The new online service launched Friday in the U.K. and follows the highly publicized success of Browder's online parking ticket appeal service, which started in the U.K. but recently expanded to New York and Seattle. Browder estimates he has saved drivers about $5 million through successfully appealing 180,000 parking tickets. It's not a glamorous website and it's got a few kinks, but it generally works as promised. A tenant simply has to answer a few questions with an automated bot. Then the service will draft a formal legal document that can be easily emailed to the landlord to demand repairs. "I'm trying to level the playing field with chatbots so anyone can have legal access for free," Browder told CNNMoney. Browder said he doesn't make any money from the service. "I think it would be morally wrong to charge people... I think the most vulnerable are using my services at the moment," he said. The DoNotPay chatbot is also designed to feel approachable, using friendly-sounding phrases like: "I almost forgot to ask what your full name is. What is it?" But the legal document it produces is formal and direct, using sentences like: "In light of the recent condition of the property, I respectfully request you repair the property to fulfill your obligations under Section 11." "I'm just one person but I'm trying to expand as quickly as possible," he said. Chatbots have become a big deal this year, with Microsoft (MSFT) and Facebook (FB) getting in on the game. CNN offers a chatbot through Facebook Messenger where users can message topics like "zika virus" or "politics" and CNN's bot will respond with related stories and information. Microsoft's Twitter (TWTR) chatbot -- named Tay -- stirred controversy and was taken offline in March after it delivered a string of racist and misogynistic tweets. Microsoft explained Tay had a "vulnerability" and apologized for the incident.